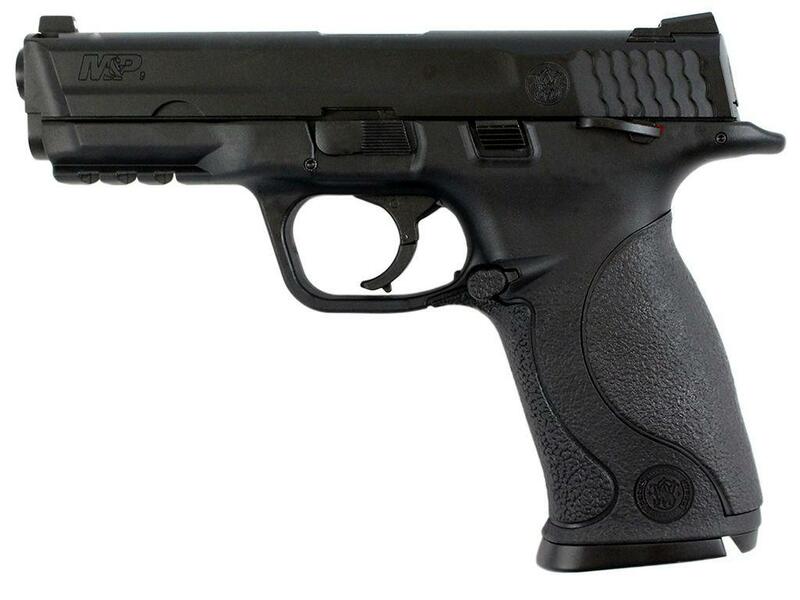 Smith & Wesson M&P9 Airsoft Pistol CO2 | ReplicaAirguns.ca | Easter Weekend Sale! Comments: The Smith & Wesson M&P9 Airsoft Pistol is a powerful and compact pistol. Whether you use it in high-pressure tactical operations, or for casual target practice, it is sure to put in an impressive performance. This compact CO2 pistol can shoot out airsoft BBs at velocities of 377 FPS, and features an adjustable hop-up system, metal slide, and rail frame. The realistic blowback action is icing on the cake. This is a really nice little shooter - gas efficient with a solid, good-looking external build. I managed to shoot 8 full magazines (~120 rounds total) out of a single 12-gram CO2 cartridge, and only started noticing a slight drop-off in power after 6 mags. After 8 mags, I was still able to shoot about 5 more BBs, except there was no longer enough gas to fully cycle the slide and I'd have to manually recock the gun for each shot. Functionally, the controls have a good, positive response. Both sides of the ambidextrous controls (slide release and thumb safety) work well, and the slide makes a very satisfying CLACK when closed. The blowback is crisp and snappy as one would expect from a CO2-powered pistol. The magazine spring is a little stiff, however, and your thumb may get sore if you're reloading a lot. The build quality of the gun is also really nice. It has a good heft to it despite having a polymer frame, and I like how the frame has a subtle matte finish, not shiny like cheap plastic. The trademarks are also deeply engraved and aren't likely to wear off with use. The level of detail on them is also very crisp, they're legible and don't look sloppy. The gun comes pre-installed with the Small backstrap. To change it, you need to rotate the plug at the back of the magazine well 90 degrees, then pull it out straight downwards. Then, you can peel off the old backstrap and install a new one. Once I installed the Medium backstrap, the gun felt really good in my hand and pointed very naturally. I'd barely have to adjust my aim to line up the sights. All-in-all, I'm very happy with this gun. If you're looking for a polymer-framed striker-fired pistol for your loadout and don't want a Glock, this is a great choice. I just ordered this gun as my first Airsoft gun and when it arrived I was really impressed. The gun is really comfortable to hold and with the 3 different back pieces which are interchangeable it is a big plus. The gun fires great and I was able to fire off almost 5 full magazines from just one Co2 canister. The blowback is smooth and really gives it a great feel when you shoot. It is very accurate with only 3-4 shots that seemed to wander slightly off centre. I would recommend this gun to anyone. Best airsoft pistol I've used yet. I purchased this pistol when it was on sale last month. But after using it, I would gladly buy it again at full price. I have fired many different pistols, both airsoft, and actual firearms, and this one impressed me the most. Right out of the box, it had a great feel, and look. And as for accuracy, even with mixed weight bb's, it was a nail driver straight out of the box. The sights are perfectly aligned, and very easy to bring on target. The co2 gives this pistol a very snappy, realistic recoil, and it is very gas efficient. I was able to average 5 to 6 full mags of bb's per co2 canister. Even while doing multiple rapid fire drills. Also, with the co2, you don't have to fumble with loading gas into the mags like green gas. Plus you do not get the smell from green gas/propane when you use it indoors. I would recommend this pistol to anyone, without any hesitation. It is a fantastic value, and a ton of fun. The only down side about it is that the spare mags are a little pricey, but the quality of them is excellent, so they are still worth getting.All in all, if you only buy one airsoft pistol, I think this is a great choice.